Bermuda is a 21 square mile (56 kilometers) land area cluster of mostly interconnected small islands in the north-west Atlantic Ocean. One of the nine smallest places in the world, it is located about 600 miles due east of the nearest mainland. Many people are surprised to learn that it is not in the Caribbean, but 900 miles north of it. Bermuda has a wide variety of accommodations to suit any type of vacation. Choose from the following to get your Bermuda Trip started. Apartments – for those looking for a ‘home away from home’ vacation feel. Cottages – Cottage Colonies are uniquely Bermudian and have a variety of amenities. Flotels – Why stay on land when you can set sail and enjoy Bermuda by sea? Guest Houses – Provide a level of comfort and charm uniquely their own. Inns or Beds and Breakfasts – Scenic ocean views and centrally located properties with self service ammenities. Resorts – Stunning properties with all the amenities; from world class spa’s to fine dining. Small Hotels -Small hotels are the backbone of the Bermuda hospitality industry, each one of them has their own personality. 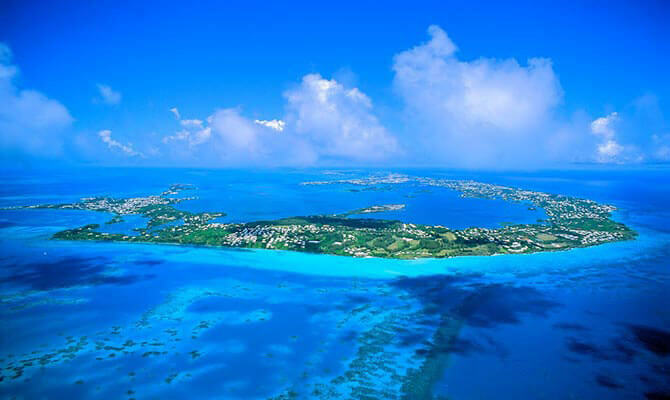 Vacation Ownership – Owning a piece of Bermuda is a wise choice for the repeat visitors. Take the stress out of traveling to Bermuda with children and babies use Little Longtails a baby equipment rental company here on the on island. Rent everything from Cribs, highchairs and Beach Toys delivered direct to your accommodation. Kiddie Concierge get essential provisions delivered direct to you. Once you are on the island, getting around to see all the sights is as easy as 1, 2, 3. Other than the above transport, a variety of taxi’s and tours are also available for your convenience. Due to its geographical location, getting to Bermuda is easy by air or sea. There are daily direct flights to Bermuda from the US, Canada and UK. Some are daily year-round, others are bi-weekly or seasonal (usually May to October). With flights just over 2 hours long, your Bermuda vacation has never felt so close. The following airlines provide non-stop service to Bermuda. WestJet Airlines. Bi-Weekly To/from Toronto. Delta Air Lines. Daily to/from Atlanta, Boston and New York. JetBlue. Daily flights to/from New York. United Airlines. Bi-weekly to/from New York. British Airways. Daily flight from London, England (Gatwick).